Chronicles of a Foodie: Foodie Adventures in NYC! I got in late Wednesday night so my first real meal on my vacation wasn't until the next day. I had heard so much about Shake Shack being the East Coast equivalent to our West Coast In-N-Out so I knew I had to try it. It definitely had a larger variety on the menu than my beloved In-N-Out, boasting Chicago style dogs, concretes (like DQ Blizzards), and a selection of alcohol. I had to go for the Shack Stack, a cheeseburger topped with a portobello mushroom that's stuffed with cheese, breaded and fried. The first bite is just an explosion of cheesy goodness that's one of the best burgers I've ever had. After a day at the Metropolitan Museum of Art I took an afternoon snack break at Lady M. A popular confectionary boutique, the desserts offered at this little shop are their own pieces of art. Most famous for their crepe cakes, a cake made up of twenty crepes stacked and layered with creme these treats melt in your mouth like a cloud. 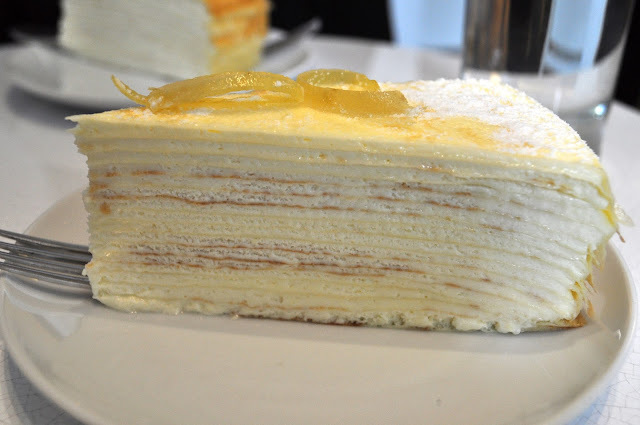 The Citron one I had was a seasonal flavor, the most popular item on the menu is the Lady M Mille Crepe, a whole cake will run you $75, but even a single slice at $8 was a little steep. 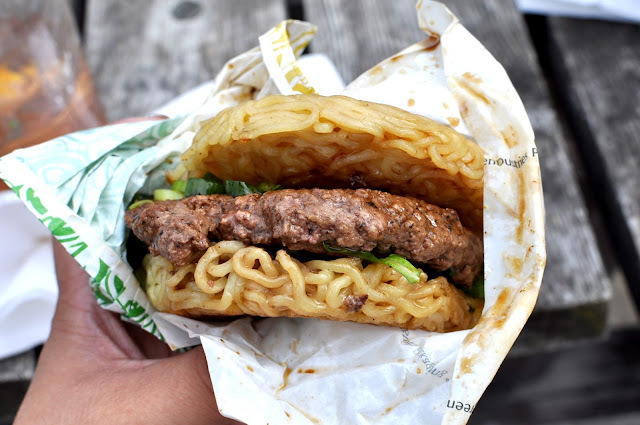 Behold, in all it's fusion glory, the Ramen Burger. This crazy concoction made it's debut in New York at the start of August and is served up at Smorgasburg every weekend in Williamsburg. There's usually only about 250-300 burgers sold at each event with a wait of an hour or so. We waited about an hour and a half but that was only because the grill went out right when we were in the top 10 to get our Ramen Burger on. A beef patty topped with arugula, green onion, shoyu sauce and nestled between grilled ramen "buns" this was definitely one of the most interesting hybrid foods I've ever had, but nonetheless it was absolutely delicious. The shoyu sauce mixed with the green onion and ramen brought traditional asian flavors to an american classic. The beef was cooked to a nice medium allowing the patty to still be juicy and have a nice pink hue inside. I do wish the ramen buns would have been a little more crispy to add more texture to the dish, it was mostly soft, on soft, on soft, but other than that I loved it. Besides eating all day I went to a speak east for the first time, explored New York's bar scene and even hit up some very popular NYC favorites: Momofuku Milk. Georgetown Cupcake, The Halal Guys (Chicken over Rice...I'm so mad this isn't in LA! ), Times Square etc. I hadn't had Halal chicken over rice since my UC Davis College days and I could not believe how much they give you at these NYC carts for $6! I was more mad at myself for a) not finishing it and b) not being able to save it since I was going barhopping later. Overall I had a great trip! I can see why NYC is such a hub for food lovers, there's literally EVERYTHING within blocks of each other. 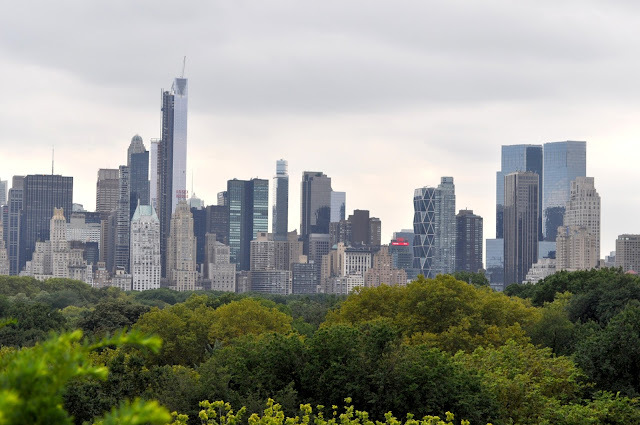 You can go from Little Italy and enjoying some NY style pizza hop on a subway and end up grabbing falafel or even walk across the street and grab some ramen. My trip was my first time on the East Coast but it definitely won't be my last. The way my friends talked about this city they now call home made me think that I need to head out to the heart of LA and explore more often so I too can have that passion for my city. Aw, I miss NY. I consider it my second home (and really it's my first since I don't like LA that much)... I am so jealous you got to try the Ramen Burger. I don't know why I am so fascinated by it but I wanna try it! Looks like you had a good time! I have never seen a ramen burger before! How unique! Also that burger and those fries from the Shake Shack looks mouthwatering!